All aluminum SVT 8.8 axle cover. This is the original equipment for the Boss 302 and Laguna Seca edition Mustangs. Adds rigidity to the rear axle and reduces gear oil temperatures. 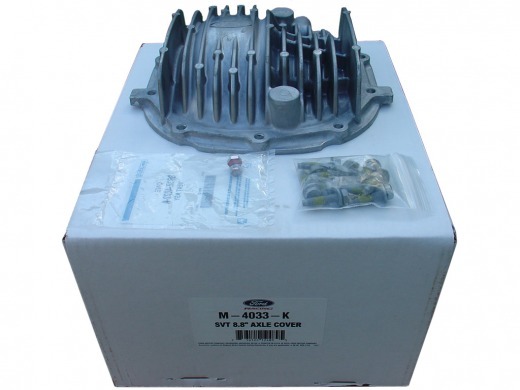 Includes 10 new Ford bolts for installation and plug for relocation of the axle vent. Clears late model Mustang pan hard bar. Easy installation and looks great from the rear. See assembly pictures for installation. Ford Racing SVT 8.8 Axle cover, Installation harware and vent assembly.